1. I always recommend having one in the center of the ceiling in bedrooms. The advantage to this is, it is a cost-effective way to circulate the air around in your bedroom, where you want to be rested and comfortable in the winter and the summer. A ceiling fan with a light adds light to the center of the room. 2. Many people who have a ceiling fan don’t know why there is a switch on the side of the fan, unless they installed it themselves, or they read the owner’s manual that came with the fan. The switch is to change the directional flow of the movement of the air. Whether it be moving the air up or down. This feature most people don’t use, because they don’t realize the advantage of this function. In the Summer time you want the air flow to push the air down, in the winter time pull the air up. The reason for this is in the summer time you want the air moving down, forcing the cooler air up. In the winter time you want to force the warm air down by forcing it down the walls, making the room an even temperature. Most of you out there probably only use your ceiling fan in the summer time. I challenge you to use it in the winter too, to circulate the warm air in the room. I usually just turn the ceiling fan on low in the winter time. 3. Depending on the size of your room and the decor this can really effect the ceiling fan you purchase. Find one that matches or goes well with what your room requires. Two things that I always recommend is: purchase one that has 5 blades instead of four, and if the room allows, get one with longer blades. The reason for the two recommendations is that these two are directly related to air movement. I have lived in two different apartments where a 4 blade ceiling fan with short blade lengths were installed, and both of them didn’t circulate the air effectively. Some ceiling fans come with a remote to change the speeds and turn on the light too. I recommend not using these. Instead I only recommend using the Westinghouse ceiling fan remote. Once you install this remote, you’ll thank me. The reason is, it has an automatic setting or manual setting first off. Which means for instants you want the fan on high (manual mode) as you walk into the room, you can do that. But what is even better is the (automatic mode). Lets say you get home from work and the room is hot (88 degrees), you turn the remote on to the desired temperature that you want the room to be (68 degrees), crack open the windows and doors. As it pulls in the outside cooler air, it will automatically kick down the fan speeds (high, medium, low) until it gets to your preset desired temperature. Once the desired temperature is reached, it automatically shuts off. I use this function every night as I go to bed in my bedroom making it a very restful and comfortable nights sleep. If the temperature during the night just happens to go up for some reason, it will also kick itself back on. Another nice option to this remote is it can turn the light on the ceiling fan on and off. But it can also dim the light. If you want he light to be dimmed down to be softer on the eyes at night, you can. When you turn it back on, it’s still at the dimmed down light until you turn it back up to full brightness again. Or do what I do and hit the light button on the remote to turn the light off, and roll over and go to sleep. 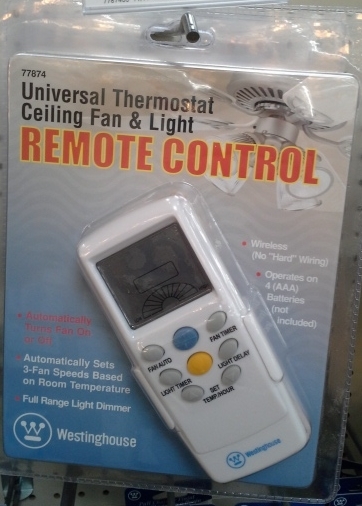 This remote can also be installed on any existing ceiling fans too. It comes with a remote with a hangar sleeve that can be used to mount the remote on the wall, and a receiver that is hardwired into the ceiling fan. I have installed many of these on existing ceiling fans. It takes about a half an hour to install depending on what brand of ceiling fan. It can be installed in each room too, and programmed to work on different frequencies so the master bedroom ceiling fan won’t control the living room fan. 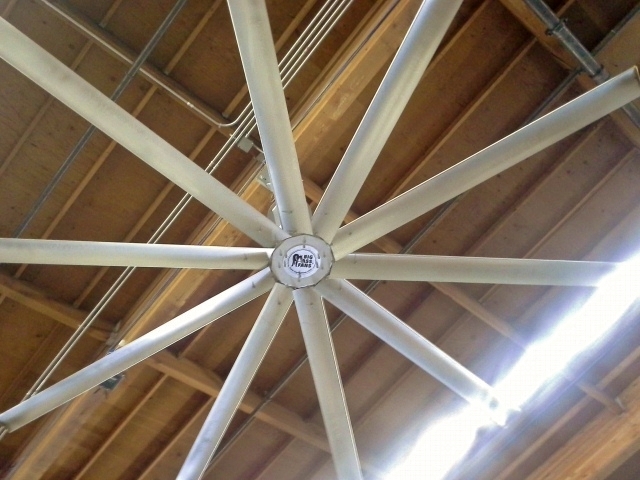 *Many of the newer ceiling fans are also Energy Star rated with some having fluorescent or LED bulbs.